Host: Welcome to the Dad’s Guide to Twins Podcast. The Podcast that will help you survive and thrive as a father of twins. Now, here you host. 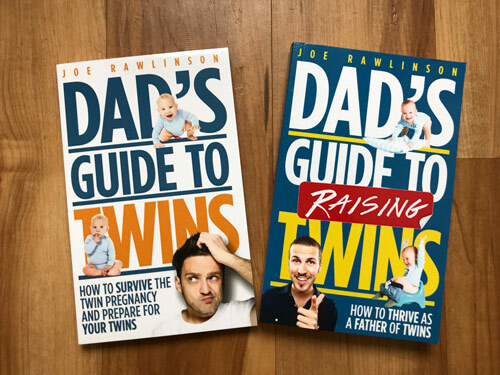 The author of the book, The Dads Guide to Twins, Joe Rawlinson. 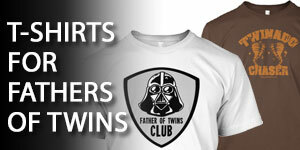 Joe: Hi there and welcome to the 95th episode of the Dad’s Guide to Twins Podcast. This is Joe Rawlinson. As always you can find me on the web at twindadpodcast.com where you’ll find much more information on having and raising twins along with the short notes for this episode. In fact, you can go back a listen to all previous podcast episodes at twindadpodcast.com. 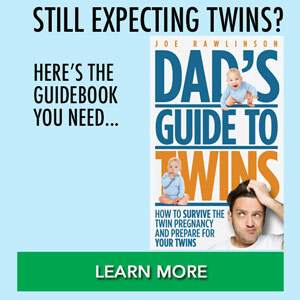 I’m excited to share with you, the listener, that I’ve made a special deal with Audible where you can get a free audiobook version of my book, The Dad’s Guide to Twins, as freetwinbook.com. Once again that’s, freetwinbook.com. If you’ve been a longtime listener of the show you know I love to answer questions from parents just like you. If you’d like to have your question answered on the show, please call my voicemail number and leave your question. That is 512-222-9325. On today’s show we’ve got a special guest continuing our series of interviews with fathers of twins. Kevin Valudes [SP] is a father of identical twin girls and he joins us today to share some of his experience with you. Let’s jump right into that interview. 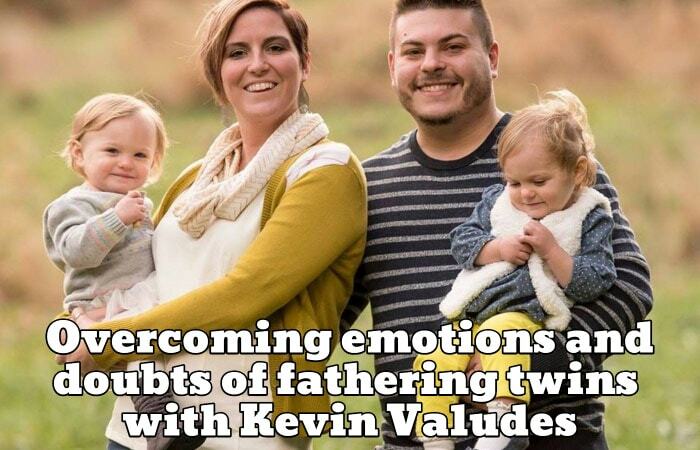 Today on the Dad’s Guide to Twins podcast, I’d like to welcome Kevin Valudes to the show to share some of his experience that he has had as a father of twins. Welcome to the show, Kevin. Kevin: Hey, Joe. How are you? Joe: I’m wonderful. Thanks for joining me today. So, can you give our listeners a quick snapshot right now of your family and life so we can get to know you just a little bit better? Kevin: Well, my wife Heather and I, we got married back in 2010 and things we’re going along and we had talked about having children, but is was never, never decided upon really, one way or the other, and then it just happened. And we found out that she was pregnant and were obviously overjoyed and I remember, leading up to that, basically my entire life, I’d never wanted to have twins. I was adamant about it actually. It just seemed like such a mess. And so anyway, the night that we found out that we were having twins, we’d had my mom over for dinner and some other family and they came over and they had seen a baby shower invitation on my refrigerator for an old co-worker who was actually preparing to have twins himself. And she said, “I can’t believe he’s having twins.” and I said, “I know, can you imagine that? I would never want twins.” And then a few short hours later, my wife and I were sitting in the hospital having her first ultrasound and the nurse was scanning around and she was like, “Wait, it kind of looks like there might be two.” And we’re like, “Well, you should probably go get a second opinion on that because there’s no way.” And so she left the room for eternity, or so it seemed, and she came back and she was scanning around again and she said, “Nope, there’s definitely two. There’s one and there’s two.” And that was the craziest moment of my life. My wife and I were, I think, both very, very excited and both scared at the same time. We just didn’t imagine that. We went there just expecting to see one little embryo and it ended up being two and then life, ever since then, has been chaotic, but it has been a real joy at the same time. Joe: Yeah, that’s a good summary. Chaotic and yet, a joy at the same time. Yeah. Well, that’s quite the initial reaction. I had very similar reactions of disbelief and shock when we found out we were having twins. I wasn’t even at the ultrasound with my wife and so she told me over the phone. And that probably wasn’t the safest time for me then, to go drive and pick her up after that. Kevin: Yeah, it’s definitely … I remember the initial shock and it was like, “How are we going to do this?” I think that was the scariest part for me, is that these are our only children. And so I think that everybody probably has those feelings of, “How am I going to be responsible for one life, just raising them and the financial aspect and everything that goes along with having a child. And then it’s, “Okay, how are we going to do this times 2?” And that was the scariest part for me, is that I, an untested father, and then all of a sudden, it was going to be two. That was really scary. Joe: Absolutely. It’s like a learning curve of being a dad and then you’ve got two at the same time. In our case we’d had two boys before our twin girls so I knew how bad it was going to be, because at least I knew how bad one baby was. So, twins from the get go is a bit overwhelming. So you shared some of your initial concerns around, “What are you going to do? How are you going to take care of both? Financial concerns.” Was there something that you all did during the pregnancy to help you get ready to help overcome those concerns? Kevin: We talked a lot and then we had planned on telling our family a little bit later than we did. But I think it was our second appointment that we had. The nurse that we had scared us a little bit. She was very, I don’t want to say over the top, but kind of over the top. She just made it seem like a super, super high risk pregnancy, because we have identical girls and they shared the same placenta. They were in two different amniotic sacks, but shared the same placenta. So she expressed to us that that was a concern and a higher risk, but she made it sound like it was the end of the world, so we were both very scared. So we told our parents a little sooner than we were planning on it but we did that just so we had more people to talk to and comfort and support us. And it ended up being a good decision. Everyone was super excited. So it was fun to see their reactions to that as well. That was probably one of the funniest parts, was telling our families that we were having twins. Joe: Did you do something special to announce that they were twins? Kevin: Yeah, we did actually. It was right around Christmas time that we found out and we told my Mom on her birthday. And we’d actually wrapped up an ultrasound picture in a frame and gave it to her with a little poem and gave that to her as her birthday present. And she flipped when she read the poem and saw the twin pictures, so that was really nice. And we did a similar thing for my in-laws. They got the picture and a different card with a poem on it and they all really enjoyed the announcement aspect of it, I guess, getting back to where I was originally going with this was, we did a lot of talking, my wife and I. And I went through periods of the pregnancy where I felt a little bit bitter, I guess, to be honest. It was like, “I don’t know how I’m going to handle having two children.” and I was just thinking about all of the complications. I wasn’t thinking about any of the positives and that’s one thing I regret. Because looking back now, it was such an exaggeration in my head. Like, “Oh, life with twins, it’s going to be messy all the time and it’s going to be chaotic and it’s just going to be chasing them around.” And while it is all of that, it is also, the tiny parts in between there that really, really, really make it all worth it. But, yeah. That was probably one of my biggest struggles throughout the pregnancy, was coming to terms with it and just accepting it. And then, towards like I would say the last six months or so, I was super excited and ready for them to come. Joe: How many weeks along were they when they were born? Kevin: My wife actually had them at 36 weeks. She has a scheduled C-section so that was really good. She didn’t actually have to go under bed rest, she worked. They were born on a Tuesday. She was able to work right up until the C-section, actually. She worked until that Friday and then we had the weekend and a Monday and then we had the girls. Joe: Wow, so she worked right up till the delivery. That is impressive. Kevin: Yeah, she was very, very lucky and she was a very good sport throughout the entire thing. Joe: How did the delivery go? Were there any problems or how was recovery for mom and babies? Kevin: No, delivery was actually very smooth. I’m not too sure how all other births are, but the room was crowded, so be prepared for that. I think there was two nurses for every baby and then the doctor and anesthesiologist. It was just packed full of people, but they came out and it was a bang, bang thing. The funny story about that is, throughout the entire pregnancy there was Baby A and Baby B and we decided that Baby A was going to be Stella and Baby B was going to be Bridget, and then they actually pulled them out vice versa. So the entire pregnancy, Baby B was Bridget and then she came out first, so then the hospital knows her as Baby A. And so when we’re in the hospital, they’re like, “Okay, which one’s Baby A?” And we’re like, “Well, that is your Baby A, but that is actually our Baby B, but that’s Bridget. We’ll just go with Bridget.” So that was a funny thing right away. Joe: Did your daughters have any complications or were they able to go home with mom after she recovered? Kevin: No. They were fine actually. There was, I don’t remember. They do a lot of different tests on them while they’re in there the first couple days and there’s a lot of heel pricking that goes on. And that’s one of the worst things in the world to watch just because they’re so, so little and they cry so much when you prick their heel with a needle. But anyway, Bridget was actually … one of her tests was low on something, so it ended up, they had to keep pricking her heel over and over and over again and it finally, whatever it was, got to the level it was supposed to be at. So they were able to leave on that Saturday and the entire thing was pretty smooth. At least I would say so. My wife actually, her pregnancy was good the entire way up until about six and a half, seven months. She got Cholestasis which is a condition you get when you’re pregnant sometimes. The way I understand it is, your liver isn’t absorbing all of the acid and then it’s dissipating throughout your body and going through your skin and it makes you super, super itchy. So she was not a happy camper the last few months and it was actually really sad to watch because she is a very, very strong woman and I’ve never seen, or I haven’t seen much bring her to the point of tears. But her itchiness, and the itchiness lead to insomnia, so even those last couple months you really need to get you sleep to prepare for the hectic life you’re about to lead. And we weren’t able to get all that much sleep because she was just so itchy, she couldn’t fall asleep and she couldn’t stay asleep. But other than that, that was really our only complication, luckily. There was, the doctor said, just a tiny bit of twin transfusion. I think, Stella at the time was Baby A, so she was getting a bit more of the nutrients and she was growing a little bit bigger. She was born at six pounds, six ounces and Bridget was five, two. And they kept a little bit of a weight difference the entire time, even up till now. Stella’s just a little bit heavier, but they’re both growing really well and developing fine. So it hasn’t been … I think that was one of the things that scared me too, was that there was so much that could go wrong. And so to escape that without really anything, was a big relief for us. Joe: Yeah, absolutely. We had some similarities with our pregnancy. Our girls are also identical and they shared a placenta just like you were describing. And they did have different weights coming out and they’ve maintained that differential. One is still a little bit bigger than the other one and they’re almost seven now. I’m glad things went smoothly there at the delivery and bringing them home. How did you and your wife manage time off at work and making arrangements for that? Kevin: Well, funny story. I had actually … my last day at my job was that Friday, the same day that Heather’s was, but I was actually starting a new job the following Monday after the twins were born. It was bad timing, but it was the right decision to make, but it was scary. Right when you’re about to have any child, let alone twins, is a scary time to make a big job change, but it ended up working out really well. But I had off for the entire week that we were in the hospital and my wife had some maternity leave and some vacation time that she had saved up. So she actually had off from the end of June until Labor Day, the Tuesday after Labor Day was here first day back at work. So she had a couple months off. Joe: So how did you manage a new job and newborns at the same time? Kevin: I went from working 40 hours a week and overtime if I wanted it, to a job where sometimes we’d work 80 hours a week and sometimes we’d work 40. It just depends on our … I work for a shop doing scenery for stages and music award shows and stuff. So depending on our work load, our job or our hours changed per job. So I don’t know, that’s just like one of the funny things that I read about. Just going into survival mode and I think that’s what it was for all of us. It was just, you do what you have to do to get through each day and each moment really. Because all those temper tantrums or the cries in the middle of the night, they’re just moments and they pass. And they seem really terrible at the time but you get through it and it’s not really as bad. Looking back now, whatever, I may have been up for a little bit in the middle of the night, but it all worked out and we’re all okay now. So, at the time, the long nights and the early mornings were stressful and it drained us a lot but I think it made my wife and I a stronger team. I’ve done a lot of reading about having twins and how everybody says, “Team work is very important.” And whether you want to or not, you just do things together or you do things for each other when the other one can’t and it’s just the way you make it work, I guess. You don’t really have any other options. You both really have to be involved, but I was actually happy in that I’ve always wanted to be involved. I don’t know, there’s a lot of parents out there that I’ve found that aren’t as hands on all the time and my parents always were. My dad was always there for me and I wanted it to be the same way. And having twins, you do not have a choice really. It’s just everybody pitches in and helps out and you do what you’ve got to do to get by. Joe: That’s true. I think that’s a great attitude and position to have, of team work, filling in the gaps where you need to and being a full partner in raising the twins. Because as you mentioned, it is a necessity to enable you to get anything done, to even take care of the babies. Did you have anybody else helping or staying with you, any friends or family or was it just you and your wife? Kevin: No, it was not just me and my wife. We have had so much help. We have always been really busy people. Having the twins didn’t really slow us down, it just added to the busyness of our lives. But we were lucky to have my wife’s parents, were right down the road and my mom is right down the road and they are always around. My dad and stepmom come down a lot to hang out and the Godmother of our girls, she and her daughter have been great. It really has been a big time effort and I think this whole experience has really made me realize how luck that I am. Because I see a lot of articles that twin parents, right, that they say that they might not have a lot of help and, “What can I do? I need some help, but I don’t live around my family or I don’t have any friends that can help out.” And that just makes me realize how lucky that we’ve been. Because we have a great support system and I don’t know how people do it without that. So to all of you listeners out there, kudos to you because this is really, really tough and it would be a lot tougher if we didn’t have the family and friends around that we have. They have been terrific. Joe: Yeah, I know that was a huge blessing to us too. We had, we recruited them to come and stay with us for several weeks after the girls were born and it helped a lot. Were you all breastfeeding the babies or bottle feeding? Kevin: A little bit of both. My wife breastfed say, from the time they were born until October of that year. She went as long as she could. I think working made it tough, plus, just having two makes it tough. And I think it went from being breastfeeding as their primary and formula as a supplement, to formula being a primary to breastfeeding as a supplement. We would send bottles that my wife had pumped, we would send that to daycare with the girls and everything, but I think it got to the point where it was like, “I’m not getting very much out of this.” So it was just time to stop. Her body told her it was time to stop. She had a couple months and I think that she would’ve liked to do more, but it is what it is. Joe: So what did you find your role was in feeding the babies during those first several months as she was breastfeeding and then as you transitioned to bottle feeding? Kevin: I remember there being a couple frustration points for me because you’re up in the middle of the night. I think a lot of those times it was just as support for my wife and to hold another crying baby while she’s got the other one who’s crying. There were definitely times where it like, “Okay, I don’t know what to do right now and I feel helpless.” And so I think that, that was a frustrating point for me, but it was just one of those things. You need to be there and be supportive, but that’s what I felt. And there were times that we had breast milk in the refrigerator that we were able to warm up and then I could feed one of them also. She did get a pillow, a Boppy Pillow. One of our friends that had the twins before us, she had actually given her one especially for twins and that was a real big help. She used that a lot, especially during the day when I wasn’t around to help out. She became a professional breast feeder so that was good for her. Joe: When you brought the girls home, talk to us about the sleeping arrangements that you had for them. Were they in their own room, crib, bassinet in your room, how did that work? Kevin: Well, when they first came home, I don’t think they slept at all. Then they went to a co-sleeper that we had gotten. 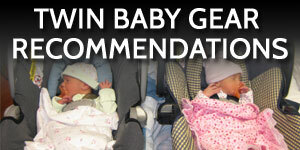 It was a dual co-sleeper so, it’s kind of like a playpen thing with a bassinet type top for two. It attaches to your bed. So they slept with us and I honestly don’t remember. I mean everybody always asks me about their first year and I just don’t remember it. There was so much and there was so little sleep. I remember they were in that for a little bit and then we tried to transition them to their cribs as early as possible and I would say, probably two months that we actually kept them in their cribs and they didn’t do too bad. I think we kept the co-sleeper around just in case they woke up and didn’t want to go back in their cribs. Yeah, I don’t really remember it. I just remember the crying-it-out nights, those were terrible. Those were just really sad, I think, more than frustrating. It was just sad to hear them crying because you don’t want them to think that you’ve abandoned them. But at the same time, you really got to try to be tough and let them work through it and comfort themselves, so that they do go back to sleep and you can have at least a couple hours where you can get a few moments of shut eye and charge your batteries. Right now they are pretty good. I mean we went from going to bed at 7:30 to 8:00 and right now, now that it’s summer time and it’s light out until 9:00, we’ve actually been going on walks from 7:30 to 8:30-ish. So when we get home we start winding down, change the diapers, change into their pajamas and read a book or two. Usually the exact same book. They’ll take a book, one of us will read it and then they’ll take it to the other parent and say, “Read this book,” and we’re like, “We just read that book.” But, so yeah, right now we’re at that stage. We go back to bed and put them down and sometimes you hear they’re back there chattering and singing and sometimes they throw all their stuff out of their crib. That’s usually only at nap time though, not so much at night time, but definitely at nap time, they just throw every single thing out of their crib that they can get and chuck that onto the floor, and then they just sleep there with nothing. But right now, we’re still in cribs. We haven’t really talked about transitioning them to a bed. They haven’t tried to escape the crib yet, not that we know of, anyway. They haven’t gotten out or they’ve gotten back in, I’m not sure. So right now we’re just letting them tell us what they’re ready for, I think. That’s what we’ve been doing this whole time, I guess. Joe: What surprised you the most? I think you said your girls are almost two now. So, what has surprised you the most about having twins? Kevin: Oh, you know what surprised me the most was that people that you meet, unwillingly. Everybody just comes up to you and tells you how they have an ex-boyfriend cousin’s sister-in-law had twins at one point. Or some crazy story like that. And they’re just such a spectacle when you go out in public. And I didn’t think that was the case. I mean any time I saw twins in public, I was like, “Oh, there’s twins.” but I would never go up to them and say, “Oh, my grandmother was going to have twins and then she had a miscarriage.” But a lot of people do that and that was actually really surprising to me and that’s a surprise. And we actually went to Twins Day’s Festival last year in Twinsburg, Ohio and that was a lot of fun. I didn’t think that they would be a spectacle there because everyone is a twin or a multiple, but they were. I think it was just what you do there. You take pictures with everybody. It was a lot of fun and we had a great time and I think that the girls will enjoy it when they’re a little bit older and can actually play with people. They were just 14 months when we went last year so it wasn’t a big thing for them. They just hung out in their stroller and stuff and didn’t really want to walk around a lot, but I think when they can actually meet friends, they’re going to really like that. Joe: So you mentioned that they’re almost two. What is working right now, as you’re parenting your girls? Kevin: Keeping a good schedule is working for us. I would say that has been … As much as we try to feed off of them and let them tell us what they’re ready for, we also have to maintain a schedule just so we have time. Because like I said, we are busy and so just to keep things going we like to try to stick around the same nap time and bedtime and mealtimes, anyway. I mean they’re constantly snacking, but mealtimes, we like to try to keep that around the same time. So I think that our schedule is really working for us right now. That’s about it. I don’t know how you get through any sort of disciplinary actions with them because they don’t listen to anything that I say. I’ll let you know if that ever happens. Joe: Yeah, you have to get creative. There’s always a challenge of getting them to take the action that you want them to take. The action that you want them to take changes but the resistance to it always seems to be constant. Joe: That was a surprise for me too. There’s a national organization of multiples groups and they’ve even recently changed their name, it was the National Organization of Mothers of Twins Clubs and now they’ve morphed into Multiples of America. I think going down this road that you’re describing of trying to be more inclusive of everyone, dads included, but there’s still a pretty heavy biased moms if you can even find a group, like you mentioned, based on where you’re living. So it is a challenge. That’s why a lot of us dads are reaching out to each other online trying to connect and help each other, because then it doesn’t matter where you live really. Kevin: Yeah, your site has been great just in seeing other people’s story and I actually went back through and listened to a couple of podcasts from the past. And just different things like that [inaudible 00:28:32] help hearing other people’s and I’ve seen some posts that I’ve interacted with on your Facebook and seen other people’s comments and have gotten other perspectives and ideas and given my opinion or advice on things. I think that’s been a really cool thing. I’m glad to see that. That’s been a really positive thing. Joe: Well, that’s good. 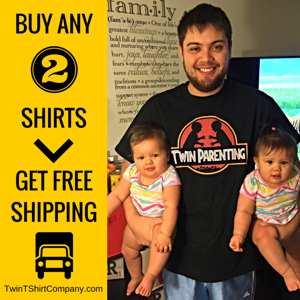 The whole reason we started this was because when we had our twins there wasn’t anything for dads. So hoping to pay it forward a little bit to those dads that are coming down the road behind us. So Kevin, as we wrap up today, if let’s say I want to connect with you, what’s the best way to get in touch? Kevin: Look me up on Facebook and message me there. I’m actually all over Facebook. I’m actually in two different bands, so it’s like I’m pretty much always on there trying to put my stuff out there. So contact me that way. Joe: Thank you for listening to that interview with Kevin as he shared his experience with you. I saw a lot of similarities between our twin journey and his as well. And I’m sure you found some things that will be helpful. No matter where you are in your journey with your twins. If you’ve enjoyed this show will you please do me a favor and leave a review on iTunes because it will help other parents, just like yourself, find the podcast. I would greatly appreciate it. Remember that if you’d like to have your question answered on the show, please call my voicemail number 512-222-9325. 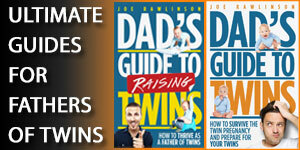 And don’t forget that you can get a free audio book version of my Dads’ Guide to Twins book by visiting freetwinbook.com. Thank you so much for listening and I’ll see you next time. Great episode, hearing the stories of other dads of twins is great and I’d definitely like to see more episodes with this interview format in the future – well done!